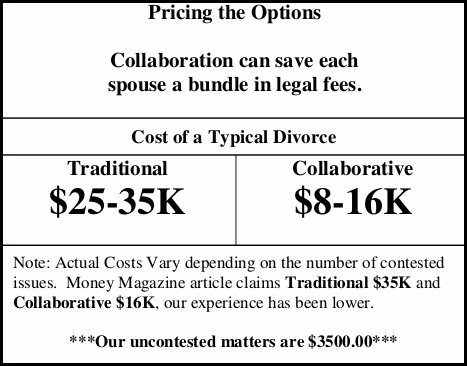 Collaborative Law is a family law process enabling couples who have decided to separate or end their marriage to work with their lawyers and other professionals in order to decrease attorney fees and avoid the uncertain outcome of Court and to achieve a settlement that best meets the specific needs of both parties and their children. In these cases, the parties strive to reach a mutually acceptable, interest-based settlement through a series of meetings, called joint sessions, between the two parties and their lawyers, and other neutral experts. The primary focus of the joint sessions is to identify the priorities, goals, needs and interests of the parties, and help them progress towards and create a settlement that is consistent with their priorities, goals, needs, and interests. The parties make their own decisions based on their own standards. There is a parallel between Collaborative Law and mediation, in that both are facilitative processes. However, in Collaborative Law the parties agree from the beginning of the dispute not to go to court. Mediation is often ordered during the course of the litigation process. In Collaborative Law, the parties are fully informed about the law and the consequences of various options and their advocates facilitate the negotiations. In mediation, the mediator is a neutral third party who does not represent or advise either side. Collaborative Law makes use of a team approach to help the couple make fully informed, carefully considered, settlement decisions. When appropriate, the group brings in outside professional to help resolve the conflict. Typically, this will include a collaboratively trained mental health professional and a collaborative trained financial professional. Divorce is an emotional process and having a mental health professional can help clients more efficiently reach resolutions. In Litigation Cases involving children, people often hire mental health professionals to prove the other party wrong. They also subject the children to these “experts” to prove a point. In Litigation Cases, financial professionals are also hired to prove a financial point. Hiring two experts is expensive. In both instances the parties’ sensitive information is exposed to the other side’s hired gun and to a public process. In the Collaborative Process, time and money is saved by the parties agreeing on one expert to make the best decisions for their children and their finances. 6. Everyone will behave courteously and in good faith. The disqualification provision is a key element to a collaborative case. It ensures that the lawyers’ interests are aligned with the clients’ interests of reaching settlement by eliminating any incentive to take the case to trial. It also ensures that clients and lawyers work more diligently towards a negotiated resolution, because if a settlement is not reached, they are “fired” by their respective clients. Otherwise, the lawyers can have a financial incentive not to settle as they can be paid quite a bit more if the case proceeds to trial. This is a process of trust. As such, the agreement not to take advantage of a mistake of the other party is intended to facilitate that trust. This is based on the understanding that when children are involved there is a need for an on-going relationship between the parties. A short term advantage that a litigator may obtain from taking advantage of a technical legal mistake of the other lawyer can lead to a long term disadvantage is harboring mistrust among the parties. As opposed to exposing your family and finances to an open court process, collaborative law respects the privacy of the family. This is important to shield the children. In cases with no children, the fact that one’s financial information is not disclosed in an open court process is important. The concept of behaving in a courteous manner and in good faith acknowledges the relationship the parties once had. It also acknowledges that the parties will have to deal with each other again in the future if they have children, and the likelihood of future cooperation is enhanced when parties can be courteous. Lawyers and clients are consistently reporting that it can be quicker, less expensive and less painful than a typical divorce, with approximately 95% of cases reaching settlement.